Clemson, SC – Nineteen former Clemson football players, including three from last year’s 9-3 team that finished 14th in the final poll were named to NFL teams on Sunday. The list also included former Tiger lineman Corey Hulsey, who had not played since the 1998 season with the Tigers. Hulsey made the Buffalo Bills roster as a guard. 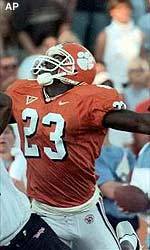 Rod Gardner (WR, Washington Redskins), Robert Carswell (FS, San Diego Chargers) and Darrel Crutchfield (DB, Philadelphia Eagles) were members of Clemson’s 2000 team that stuck with NFL teams as rookies. Gardner was a first-round pick and was a lock to make the Redskins. In fact, he is slated to start their season opener. Carswell was a seventh-round pick, while Crutchfield was a free agent. Five of the 19 players on the list are in at least their 10th year in the NFL. That list includes Chris Gardocki, in his 11th year in the league as a punter. He will play for the Cleveland Browns this year. Terry Allen is a running back with the World Champion Baltimore Ravens, while Levon Kirkland, Ed McDaniel and Chester McGlockton are all former Tigers in their 10th year in the NFL. The Seattle Seahawks will start two former Tiger linebackers in Anthony Simmons and Kirkland, while the Denver Broncos will start two former Tigers at defensive tackle in former All-Pros McGlockton and Trevor Pryce. The Seahawks, Broncos, Ravens, Chargers and Eagles all have have two former Tigers apiece. NFL teams cut down to 53 players on Sunday. Each team will have the right to add five players to practice squads this week. Among those players could be Keith Adams, who was cut Friday by the Tennessee Titans. Another surprise cut on Sunday was Rahim Abdullah, who was waived by the Minnesota Vikings. Tony Horne, an All-Pro as a kick returner two years ago, was cut late Sunday night by the Kansas City Chiefs.